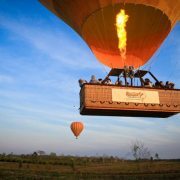 Did you know, the Atherton Tablelands, Queensland, is the most popular place in Australia to float in a hot air balloon? 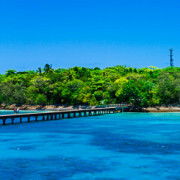 Located west to south-south-west inland from Cairns, the Atherton Tablelands elevated position provides ideal weather and climate conditions for this gentle activity. With 98% tour reliability, this statistic is unmatched anywhere in the world within the Ballooning industry. 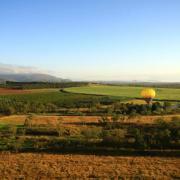 There are two long established ballooning companies in the Far North: Raging Thunder and Hot Air Cairns. Both operators are industry professionals ensuring a high level of service, state-of-the-art equipment and product quality to deliver one of the very best Hot Air Ballooning experiences in Australia. 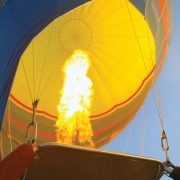 For a memorable experience, hop aboard a dawn balloon flight over the Mareeba Valley. The Atherton Tablelands is a fertile plateau that is part of the Great Dividing Range in Queensland. Views range from the dark greens of the rainforest peaked mountains to the east that form part of the Great Dividing Range, to the dusty reds and oranges of the Outback towards the western fringes of the plateau. With an area of approximately 32,000 km² and a ranging altitude of between 500 and 1,280 m (1,600 and 4,200 ft), the views from a Hot Air Balloon Flight are spectacular. As you glide over this picturesque landscape you'll see and hear Australian wildlife such as wallabies and birds as they awaken. Depending on passenger numbers there are generally two 30 minute flights operated. The first group takes to the air while the second group embarks on an exciting balloon chase from the ground. This is the perfect time to look out for awakening birdlife & wildlife. The groups then swap activities, while those on a 1 hour flight remain in the basket. Every day is different with up to 7 Cairns Hot Air Balloons floating at one time, which always makes for a great photo opportunity. 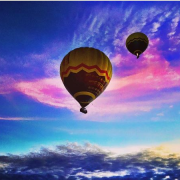 Due to the many years in the local region, hot air ballooning has become part of the Atherton Tablelands community and a well known icon, featured in calendars, local schools, kindergartens and libraries as a symbol of the Atherton Tablelands community. 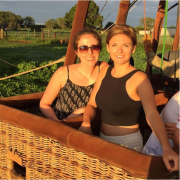 Local farming families have worked alongside the Hot Air Cairns team for over 15 years, allowing Hot Air to launch from a range of private properties spread over the Atherton Tablelands, which allows for optimum take-offs and maximum thrill. This combination of tourism and farming always brings a mix of some amazing patterns and images, when viewed from a hot air balloon basket above. Accommodation transfers are available from Cairns, Cairns Beaches and Port Douglas departing at approx 4:15am, returning 10:30am. Alternatively it is possible to self drive to Mareeba. You can maximise your day by combining ballooning with many other local tour combos such as the Kuranda Skyrail and Train.